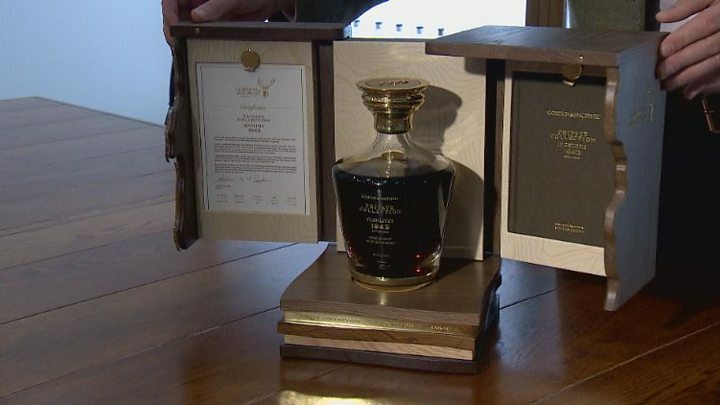 One of the world's rarest and most expensive single malt whiskies has gone on sale. The Private Collection Glenlivet was matured for 70 years and just 40 decanters are going on the market for £30,000 each. The spirit went into its cask in 1943, when World War Two was at its height and whisky was scarce. Shoosh. The cratur is sleeping. In row upon row of casks in a warehouse in Elgin, gallon upon gallon of single malt whisky is maturing. This is the family firm of Gordon and MacPhail. To call them whisky bottlers doesn't do them justice. They mature single malts, including some of the rarest in the world, until the time is right to set the spirit free. In the case of Cask 121, that process took 70 years. 14 January 1943 was a significant date. It was the first day of the Casablanca conference. Churchill and Roosevelt were planning their next steps in World War Two. Stalin had declined to attend. He was a busy man, not least because the Red Army was preparing to deal a fatal blow to the Third Reich at Stalingrad. So it is understandable that a small occurrence at the Glenlivet Distillery went unnoticed by history until now. Gordon and MacPhail's senior partner John Urquhart laid down a single cask of spirit. The war meant that laying down even that small quantity was a rare occurrence. John's great-grandson Stephen Rankin, a present day director of the company, said: "At the time the government controlled the raw materials. "The year before almost all distilleries in Scotland had closed but some were given special licences to carry on. "Due to the demand elsewhere for the raw materials these distilleries only made a small amount." So the spirit - not whisky because it had yet to mature - was already a scarce resource. And getting scarcer: the UK was exporting its stocks of mature Scotch in return for dollars which in turn could be exchanged for armaments and other vital supplies. When the SS Politician ran aground on the island of Eriskay two years earlier it had been carrying 28,000 cases of malt. The "informal salvage" operations that followed inspired Compton Mackenzie's novel Whisky Galore, Alexander Mackendrick's near-identically titled Ealing classic Whisky Galore!, several customs prosecutions and countless Hebridean hangovers. By 1943, Cask 121 - as it was known - still had a long way to go before it could contribute to the country's balance of payments. It had to wait to breathe and mature in the cask. It lay at the Glenlivet Distillery until 1967. Then, when some of us were still saving up for a copy of Sgt. Pepper's Lonely Hearts Club Band, it was moved carefully to the Elgin warehouse and sampled. Some of that 24-year-old malt still exists in a room lined with hundreds - probably thousands, I lost count - of small sample bottles. It's a whisky library, each sample taken from a cask in the warehouse. But in 1967, Cask 121 was not considered ready for bottling. It had greater potential. Stuart Urquhart, Gordon and MacPhail's associate director of whisky supply, took over the long waiting process later. "We've routinely sampled it over its time," he says, "and made a decision to bottle it in 2013". "Over that time it evolved, gained in complexity and changed." The year 2013, when it emerged from the cask into glass, is when the clock stopped. Whisky stops maturing when it goes into the bottle. Private Collection Glenlivet 1943 will always be a 70-year-old malt. But will it taste any good after all this time? That's where the science comes in. Malt whisky has four ingredients. Barley, water and yeast are the obvious ones. The fourth is wood. The cask in which the maturation process takes place. The skill in maturation is choosing the right type of wood. One that will enhance the desired flavours and aromas of the whisky and suppress the unwanted ones. So says Matthew Pauley, associate professor of distilling at Heriot-Watt university in Edinburgh. "One of the most important characteristics is where the wood has come from - whether it's European oak or American oak. "It's all about sugars - the complex sugars in the oak. And there are different levels of different sugars in a European oak versus an American oak." Other considerations include what the cask has held before. Usually it's sherry but other techniques use casks which have held port or bourbon. How the wood has been toasted and charred will affect how the sugars are released. In 1943, John Urquhart and his son George chose a sherry cask made of European oak. That's where the science stops and personal taste takes over. And a personal taste is what I got. A glass of a handsome, deep brown liquid. A dram costing about £430. Had I been paying for it, which I wasn't - and neither were you, dear licence fee payer. This was research, honest. The nose - the smell, to the rest of us - promised a lot. The taste? To my admittedly uneducated palate, remarkable. I had been told to expect burnt oranges, milk chocolate, a hint of vanilla. Perhaps it was the power of suggestion but I got all of those and more: peat and oak - neither of them to excess - sweetness, strength, complexity and subtlety. My head tried to be objective, my taste buds surrendered. And no - I didn't ask for a splash of lemonade in it. Slàinte mhath!